We prize two things in this modern game of ours. We love our tricky wingers, pint-sized magicians capable of the outlandish and indescribable. There is something of a footballing purity about them, no reliance on the brutish physicality that can bely a relative footballing ineptitude. We also love a semblance of grassroots intimacy with the clubs we support. Even in today’s world of billion pound transfer windows and offshore owners, a richness of history can maintain a fan’s relationship with their favourite outfit, however superficial. 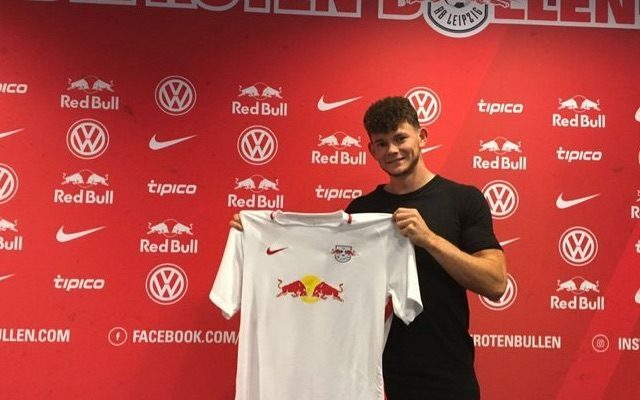 In this way Oliver Burke and RB Leipzig are a perfect fit. They both represent the antithesis of a connoisseur’s idea of footballing perfection. Not that either would care. RB Leipzig’s narrative is well documented. The side, created in 2009 by a Red Bull focus group and merged with local fifth division side SSV Markranstädt, rose from the Oberliga to reach the Bundesliga within a decade on the back of an enormous investment in facilities and players. Their side boasts exciting German youth internationals Lukas Klostermann, Davie Selke, and Timo Werner all poached from the youth systems of Germany’s stalling powerhouses Bochum, Bremen, and Stuttgart. In the unparalleled traditionalism of the German game, where fans have a hand in the running of nearly every Bundesliga club, RB Leipzig bring a stench of the synthetic and corporate. Not even the Premier League, of Russian oligarchs and oil barons, have seen this presumed desecration of footballing integrity. With Hoffenheim and now RB Leipzig, the Bundesliga has been privy to the powers of big money and big ambition that the merging of sport and business presents. Despite the collective chagrin in Germany at Leipzig’s recent successes, Burke’s move to Saxony was extremely intelligent. RB Leipzig are one of the nation’s best run clubs. They buy intelligently, amassing young talent to complement a idealistic and high octane style of play. There are no big money buys, rather calculated poaching of the country’s best talent. The majority of their squad hasn’t reached their 25th birthday, and all subscribe to sporting director Ralf Rangnick’s expansive philosophy. Burke, a physical specimen, fits straight into Leipzig’s pressing style promoted by Rangnick, the German godfather of gegenpressing. His ability on the ball is unparalleled, however it’s his physicality that sets him apart on the pitch. Shades of a young Bale are apparent in the Scottish winger, outmuscling fullbacks with a potent mix of pace and power. His shooting ability is also of high standard, look no further than his tremendous Trivela against Cardiff. If new coach Ralph Hasenhüttl can get Burke to keep his head up while on the dribble, and seek out options with a subtleness to complement his bullish brilliance, then the teenager could be a genuine star turn. If anything, it is the plush confines of Leipzig’s multi-million pound training centre, the embodiment of Red Bull’s nuanced and calculated approach, that Burke most requires to become world class. The game’s intangibles come naturally to him; he is scrappy and explosive, unpredictable on the dribble, and with a healthy selfish streak that characterises confidence and promotes attacking penetration. Now he can perfect the subtle side of the game; how to press without possession, how to pick an option on the counter, how to promote ball retention as well as attacking fluidity. This match of two devilish footballing entities may well have been made in heaven.